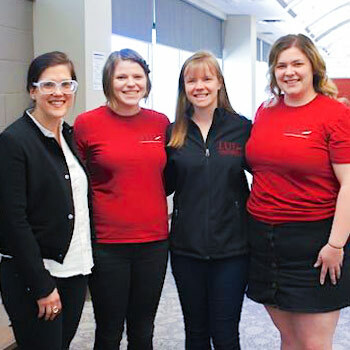 The Wilfrid Laurier University students who run the Laurier Undergraduate Journal of the Arts (LUJA) have long thought the journal helped promote high-quality student writing. Now they don’t just think it. They know it. A group of seven students involved with the journal’s management board has completed research on the effects of getting involved with LUJA. They found students learned a lot about academic writing and other skills – and that didn’t apply just to the published writers. It also applied to editors, reviewers and even management board members. The researchers surveyed 29 students who had been involved with LUJA in some capacity since it was launched in 2011. They also conducted in-depth interviews with eight of those students. “People talked about writing development, learning some time-management skills and also gaining some teamwork and interpersonal skills,” says Carina Rampelt, who recently graduated with a degree in English and French and who was the creative director for LUJA this past academic year. “A lot of the respondents noted that participating in LUJA gave them skills they were able to transfer to their postgraduate studies and employment as well,” says Brittney Tessier, who just finished her history degree and was LUJA’s secretary-treasurer. Rampelt, Tessier and Esther Brockett, a third-year biology and global studies student who just finished her second year as LUJA president, recently presented their findings on the benefits of this experiential learning opportunity at the Canadian Writing Centres Association conference in Toronto, where they received significant positive attention for their work. The other students involved in the research were co-editors-in-chief Mitchell Kooh and Mynt Marsellus, as well as Madeline McInnis and Vidish Parikh. Jordana Garbati, who co-runs the Writing Centre on Laurier’s Waterloo campus, advised the students. LUJA is unusual in being an undergraduate-run journal with no formal role for faculty or graduate students. “Undergraduate students take on all the responsibilities,” says Brockett. Also, while there are quite a few discipline-specific undergraduate journals in Canada, there aren’t many interdisciplinary ones, says Brockett. LUJA is one of only two that focus on the arts, humanities and social sciences. LUJA accepts papers from undergraduate students and recent graduates from across Canada. Getting published is highly competitive – the journal receives about 200 submissions and publishes seven or eight papers a year – an acceptance rate of about four per cent, says Brockett. The research project was also unusual in that with the exception of Brockett, who received directed studies credit for her major role, the other six students completed the work purely on a volunteer basis. Garbati’s role as research supervisor was invaluable, say the students. She trained the students on creating surveys, on a coding software program, on conducting interviews, on analysis, and on creating research presentations. The Arts Undergraduate Society financially supports LUJA and helped fund the research project, including conference participation. The Dean of Arts Office also provided financial support for the research. Involvement with LUJA is one example of the many experiential learning opportunities open to students at Laurier, whether course-integrated or co-curricular. With nearly 200 clubs at Laurier, as well as opportunities to get involved with community service-learning, volunteering, entrepreneurship and social innovation, and global engagement and exchanges, students have the chance to apply and enhance their understanding of course material in an active, intentional way. Many student research opportunities also exist.